P90X vs INSANITY – Get RIPPED Or Get Insane Results…Which Is Better? The battle of P90X vs Insanity will continue so long as Tony and Shaun T continue to reach millions with their killer workouts and motivational mojo. 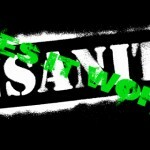 – Is P90X better than Insanity? -Which one will get me better results? -Should I do P90X or Insanity? But in reality, comparing the two workout programs is very difficult. If the two programs used similar science, equipment, program duration, etc…The comparison between P90X OR Insanity would be cake! So you understand what I mean, lets go ahead and look at the two programs side by side to see the similarities and the differences. But in reality, what’s best for me might not be best for you, so after you read the rest of this post, you are going to have a much better idea of which program you should purchase that is going to get you in the best shape of your life and feeling like a million bucks. So what can you expect to see with P90X? P90X is probably the most well rounded fitness program on the planet. Dont let that description fool you though…There is a reason those infomercial results are so extreme – Because the workouts are EXTREME! You are going to see incredible resistance training workouts, top notch plyometrics and cardio, and you even will see Yoga…Yes yoga…Its not the hippie easy stuff though! There are actually three different workout plans that you can follow, which include: Classic, Lean, and Doubles. Classic incorporates all aspects of your fitness with a large focus on resistance training using your own body weight. So you will see a lot of pushups and pullups and different variations of those moves. But you will also experience intense resistance moves for your upper body that incorporate the use of bands or dumbbells. The Lean routine focuses slightly more on those who have a goal of losing a lot of fat quickly, but I still suggest people stick with classic and you can learn why in my article on P90X Classic Or Lean. Double is simply the Classic schedule with an added cardio workout 3 days per week. If you are looking for a time friendly workout, P90X really isnt that friend. Most workouts last about 60 minutes and 3 days per week you add a 16 minute ab workout to those routines for about an 75 minute average workout time. Some of the equipment required for the program can be expensive or hard to use if you travel quite a bit, but I have found very affordable alternatives at Walmart, Target, or online at Amazon.com. One thing you might run into though as you progress through P90X is that you will notice your stamina and endurance will increase quickly and some of the cardio workouts might not be as tough as they used to be. At this point I would recommend something like a weighted vest to increase the intensity or maybe even substituting some Insanity on your cardio days. In the P90X vs Insanity battle, Insanity wins every single time when it comes to cardio. Insanity is a full body workout program that incorporates strength training and jump training, but does so at a much more intense level than P90X. That isn’t to say the Insanity is better, but I would say that if you are looking to increase your cardiovascular endurance and performance, then this is going to be your #1 choice. Whats really attractive about the program aside from the incredible results you will get, is that the program requires absolutely no equipment whatsoever…You can simply pack around your DVD set rather than your bands, dumbbells, and pullup bar. This is the program I would recommend to those who travel a lot and find themselves looking for something a little more effective that the hotel gym’s outdated stairmasters and treadmills. One other aspect that makes Insanity very appealing is that the program only lasts for 60 days unlike P90X which lasts 90 days. It doesnt seem like that big of a difference, but either way it will take an incredible amount of dedication and support in order to complete either of them. But you can get your motivation and support easy after you Join RIPPEDCLUB. And, if you love cardio, then this will most likely be the most difficult set of cardio workouts you will ever do. Its weird though because despite the difficulty and the blood in your lungs throughout the workouts (kidding…but seriously, lol), by the time you finish you feel like a million bucks and you cant wait for the next workout. People will question your sanity…And they should. One caution I have though is that if you are just now getting back into working out after taking a few decades off, dont start off with Insanity. You can, but you will most likely need to modify many of the exercises in order to compensate for your current limited physical abilities. This program is incredibly demanding physically. Another caution is that this program has a single purpose…Shed fat and get super lean. If you are looking to gain some size, then this program is not for you. P90X would be a better choice their or something like Body Beast would be even better. What it comes down to really is your personal preference on workout styles and choosing whichever program you believe you are going to enjoy the most. That right there is the most important part is that you enjoy what you are doing because you can have all the motivation, all the support, and your own cheerleading squad behind you, but if you dont actually enjoy the workouts, then you wont do them. You will hate the workouts at first because you most likely wont be able to keep up, but what makes it really fun is seeing your progress each week and seeing how quickly you get results. Both workout programs are incredible and I can personally guarantee that you will reach your goal if you follow the programs to a T…but that part is completely up to you…. So after you decide which program you are going go with, go ahead and click the ‘Programs’ tab at the top of this page to order. Then I want you to go ahead, relax, and think for a moment about how you are going to feel when you look in the mirror 60 to 90 days from now and you see the physique you have always wanted looking back at you. Let that be your first step to committing to a healthier, more fit you! BRING IT & DIG DEEPER! If this blog post on P90X vs INSANITY was helpful, be sure to click the share buttons and leave me a comment below. I want to know your experience and which workout you have found to be more beneficial and why! Lets settle the P90X vs INSANITY battle once and for all! Provide your strong reasons below! PS: If you want RESULTS just like I got, then besure to enter your name and email in the opt-in box at the top right of this page. After you click the ‘Get My Videos Now’ button, I will send you my 5 day bootcamp with step-by-step instructions on how to get insane RIPPED!!! FOCUS T25 Workout – Is This INSANITY 2? 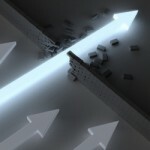 Hello, great article! I am considering P90X which I already have from a friend of mine... Here is a little history on me... in May of 2013 I weighed 288 lbs, and thru diet (The Fast Metabolism Diet) and exercise (Cardio 3-4 times a week and weight training), I have dropped down to 223 lbs. and went from wearing 42 inch waist pants to wearing 36 inch waist pants. I am 44 yrs old, a little over 6 ft, and used to lift weights a lot in the military, so I have a very muscular build, my last body fat % check 9hand held device) at the gym had me at 22%. So here is my dilemma. Since losing the weight, I have Subcutaneous fat around my lower stomach. I am not sure if I can lose this, or if most of it is just loose sking from my stomach shrinking. I have two goals, I want to lose fat, and get more cut, toning my muscle mass I now have. I really do not need to build bigger arms or chest, and mine are bigger than the vast majority of the people I see at the gym... But I would love to define it more! So, what do you think? P90X or Insanity? @safaljoshi1 how is your nutrition lookin bud? @safaljoshi1 @coachtodd that does NOT sound like a balanced plan at all. How many calories per day are you taking in and nutritionally deficient...I dont see any lean proteins, salad does not have much nutritional value...You might have some weight loss because you calorie intake is so low, but that will plateau soon. I will be finishing up p90x before too long and am considering taking on insanity next as a change of pace and to get in better shape cardio wise. I don't, however, want to lose weight or lose any strength gains from p90x. I am naturally skinny as it is, so losing weight is not a goal for me. I've seen a few people say you shouldn't do insanity if this is the case because you will lose some strength/weight gained in p90x. Im looking to tone up a little more, grow cardio wise, but not lose gains from p90x weight/strength wise...Any thoughts? Any help appreciated! 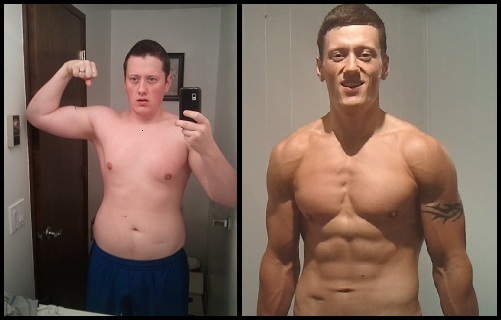 @brannonwsI gained 7lbs of lean mass in 60 days of insanity!!! I let my results slide with body beast, so I did insanity to get back into the swing of things. Here are my results: http://rippedclub.net/ripped-results/my-insanity-results/ I would say GO FOR IT!!! The program is top shelf stuff! I don't think I could do Insanity, I have tachycardia. I have no problems with P90x though. I have only done p90x DVDs, I haven't done the 90 day challenge. I actually have used it as a substitute for when I cannot make it to the gym. I have been highly interested in insanity but didn't know how similar the two were and was hesitant to spend all that money! I love the idea to have a live video discussion of the two! Glad you got some value from it bud! Are you doing either of them? Thank for the informative article! I have done both of these programs, and have to say they are honestly completely different. 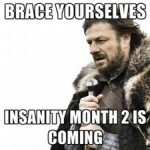 Insanity is great for losing a crap load of weight, while P90X is good for general fitness. You were right to say that they are difficult to compare.